"Arthur Robert Obst enjoying some sunny reading and relaxation time on the sheltered bay by the docking area on the Atlantic Ocean at Landeyjasandur waiting for the Landeyjasandur to Vestmannaeyjar on Heimaey Island Ferry within south western ICELAND - Major adventure travel Robert Obst Retirement Program or Adventure Travel Obst Family on Ice or Obst Adventures with Kids within and around and across Iceland 2015 (5 August 2015; Iceland Landmannalaugar & Hekla Volcano Area; Obst Photos 2015 Nikon D810 Adventure Travel Obst Iceland Image 1058)" NOTE: "The 'Capture Date" of ALL images captured after 5 AM within my 'Obst Family on Ice 2015' collection is OFF by one day before the actual date, so to determine the correct 'Capture Date' on images captured after 5 AM one must ADD ONE day to the 'Capture Date" as recorded by my Nikon D810 camera." 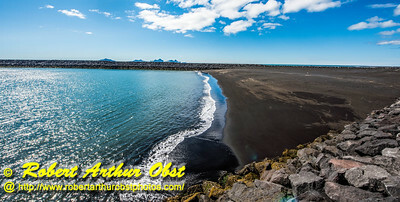 "View of the sheltered sun-sparkled bay by the docking area and Ferry Office on the Atlantic Ocean at Landeyjasandur where we will ride a ferry from Landeyjasandur to Vestmannaeyjar on Heimaey Island Ferry within south western ICELAND - Major adventure travel Robert Obst Retirement Program or Adventure Travel Obst Family on Ice or Obst Adventures with Kids within and around and across Iceland 2015 (5 August 2015; Iceland Landeyjasandur & Heimaey Island Area; Obst FAV Photos 2015 Nikon D810 Daily Best Obst Iceland Image 1056)" NOTE: "The 'Capture Date" of ALL images captured after 5 AM within my 'Obst Family on Ice 2015' collection is OFF by one day before the actual date, so to determine the correct 'Capture Date' on images captured after 5 AM one must ADD ONE day to the 'Capture Date" as recorded by my Nikon D810 camera." "View of the sheltered sun-sparkled bay by the docking area and Ferry Office on the Atlantic Ocean at Landeyjasandur where we will ride a ferry from Landeyjasandur to Vestmannaeyjar on Heimaey Island Ferry within south western ICELAND - Major adventure travel Robert Obst Retirement Program or Adventure Travel Obst Family on Ice or Obst Adventures with Kids within and around and across Iceland 2015 (5 August 2015; Iceland Landeyjasandur & Heimaey Island Area; Obst Photos 2015 Nikon D810 Daily Best Obst Iceland Image 1051)" NOTE: "The 'Capture Date" of ALL images captured after 5 AM within my 'Obst Family on Ice 2015' collection is OFF by one day before the actual date, so to determine the correct 'Capture Date' on images captured after 5 AM one must ADD ONE day to the 'Capture Date" as recorded by my Nikon D810 camera." 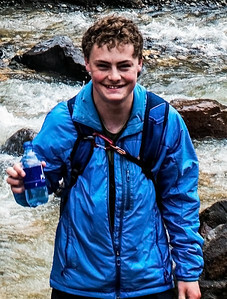 " ' Iceland Water Pure Extraordinaire ' - Arthur Robert Obst filling his water container with icy refreshment in a cascading tributary of the Tungnaa River that flows through a canyon guarded by mountains of volcanic Obsidian and Rhyolite which is situated between the Landmannalaugar Area camp and Mount Blahnukur within south western ICELAND - Major adventure travel Robert Obst Retirement Program or Adventure Travel Obst Family on Ice or Obst Adventures with Kids within and around and across Iceland 2015 (5 August 2015; Iceland Landmannalaugar & Hekla Volcano Area; Obst Photos 2015 Nikon D810 Adventure Travel Obst Iceland Image 1002)" NOTE: "The 'Capture Date" of ALL images captured after 5 AM within my 'Obst Family on Ice 2015' collection is OFF by one day before the actual date, so to determine the correct 'Capture Date' on images captured after 5 AM one must ADD ONE day to the 'Capture Date" as recorded by my Nikon D810 camera." 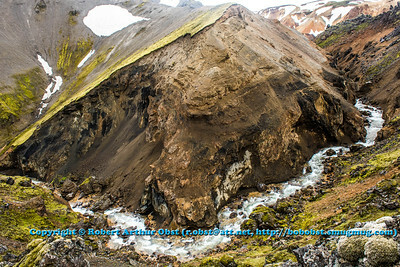 "Hiker's view of a deep canyon that follows a tributary of the Tungnaa River and that is guarded by mountains of volcanic Obsidian and Rhyolite which is situated between the Landmannalaugar Area camp and Mount Blahnukur within south western ICELAND - Major adventure travel Robert Obst Retirement Program or Adventure Travel Obst Family on Ice or Obst Adventures with Kids within and around and across Iceland 2015 (5 August 2015; Iceland Landmannalaugar & Hekla Volcano Area; Obst FAV Photos 2015 Nikon D810 Landscapes Inspirational Canyons Image 0992)" NOTE: "The 'Capture Date" of ALL images captured after 5 AM within my 'Obst Family on Ice 2015' collection is OFF by one day before the actual date, so to determine the correct 'Capture Date' on images captured after 5 AM one must ADD ONE day to the 'Capture Date" as recorded by my Nikon D810 camera." 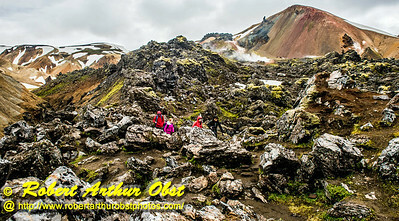 "Hikers twisting their way through a labyrinth of Obsidian and Rhyolite following the rugged trail along a canyon between the Landmannalaugar Area camp and Mount Blahnukur within south western ICELAND - Major adventure travel Robert Obst Retirement Program or Adventure Travel Obst Family on Ice or Obst Adventures with Kids within and around and across Iceland 2015 (5 August 2015; Iceland Landmannalaugar & Hekla Volcano Area; Obst FAV Photos 2015 Nikon D810 Daily Best Obst Image 0986)" NOTE: "The 'Capture Date" of ALL images captured after 5 AM within my 'Obst Family on Ice 2015' collection is OFF by one day before the actual date, so to determine the correct 'Capture Date' on images captured after 5 AM one must ADD ONE day to the 'Capture Date" as recorded by my Nikon D810 camera." 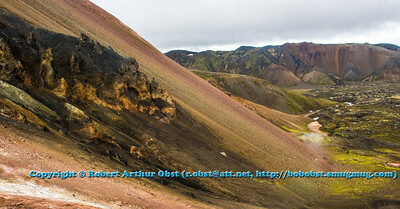 "Arthur Robert Obst and Elysia Noelle Obst enjoying their view of mountains of Obsidian and Rhyolite guarding the canyon along the rugged trail that follows a tributary of the Tungnaa River between the Landmannalaugar Area camp and Mount Blahnukur within south western ICELAND - Major adventure travel Robert Obst Retirement Program or Adventure Travel Obst Family on Ice or Obst Adventures with Kids within and around and across Iceland 2015 (5 August 2015; Iceland Landmannalaugar & Hekla Volcano Area; Obst Photos 2015 Nikon D810 Adventure Travel Obst Iceland Image 0983)" NOTE: "The 'Capture Date" of ALL images captured after 5 AM within my 'Obst Family on Ice 2015' collection is OFF by one day before the actual date, so to determine the correct 'Capture Date' on images captured after 5 AM one must ADD ONE day to the 'Capture Date" as recorded by my Nikon D810 camera." 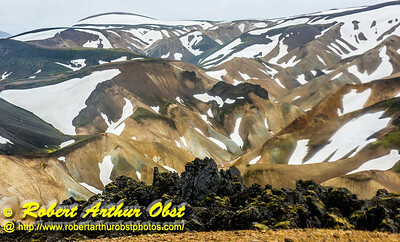 "Hiker's view of mountains of Obsidian and Rhyolite guarding the canyon along the rugged trail that follows a tributary of the Tungnaa River between the Landmannalaugar Area camp and Mount Blahnukur within south western ICELAND - Major adventure travel Robert Obst Retirement Program or Adventure Travel Obst Family on Ice or Obst Adventures with Kids within and around and across Iceland 2015 (5 August 2015; Iceland Landmannalaugar & Hekla Volcano Area; Obst FAV Photos 2015 Nikon D810 Landscapes Inspirational Canyons Image 0974)" NOTE: "The 'Capture Date" of ALL images captured after 5 AM within my 'Obst Family on Ice 2015' collection is OFF by one day before the actual date, so to determine the correct 'Capture Date' on images captured after 5 AM one must ADD ONE day to the 'Capture Date" as recorded by my Nikon D810 camera." 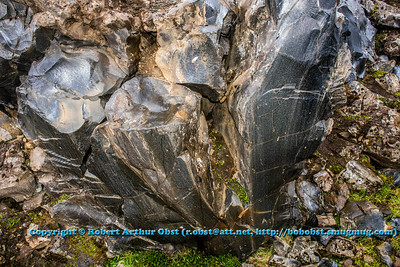 "Hiker's view of Obsidian - a naturally occurring volcanic glass - with Rhyolite - an igneous, volcanic, silica-rich rock - near its base along the trail between the Landmannalaugar Area camp and Mount Blahnukur within south western ICELAND - Major adventure travel Robert Obst Retirement Program or Adventure Travel Obst Family on Ice or Obst Adventures with Kids within and around and across Iceland 2015 (5 August 2015; Iceland Landmannalaugar & Hekla Volcano Area; Obst FAV Photos 2015 Nikon D810 Landscapes Inspirational Geothermal Volcanic Image 0961)" NOTE: "The 'Capture Date" of ALL images captured after 5 AM within my 'Obst Family on Ice 2015' collection is OFF by one day before the actual date, so to determine the correct 'Capture Date' on images captured after 5 AM one must ADD ONE day to the 'Capture Date" as recorded by my Nikon D810 camera." 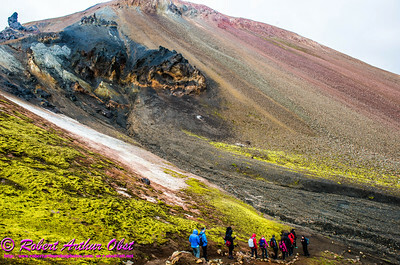 "Hikers carefully making their way past a radiant moss-covered and colorful scarred volcanic mountain during a misty and rainy day between the Landmannalaugar Area camp and Mount Blahnukur within south western ICELAND - Major adventure travel Robert Obst Retirement Program or Adventure Travel Obst Family on Ice or Obst Adventures with Kids within and around and across Iceland 2015 (5 August 2015; Iceland Landmannalaugar & Hekla Volcano Area; Obst FAV Photos 2015 Nikon D810 Adventure Travel Targeted Destinations or ATTD ICELAND Image 0953)" NOTE: "The 'Capture Date" of ALL images captured after 5 AM within my 'Obst Family on Ice 2015' collection is OFF by one day before the actual date, so to determine the correct 'Capture Date' on images captured after 5 AM one must ADD ONE day to the 'Capture Date" as recorded by my Nikon D810 camera." 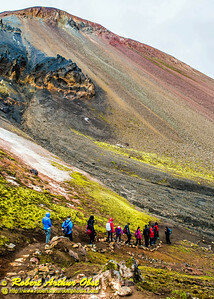 "Hikers carefully making their way past a radiant moss-covered and colorful scarred volcanic mountain during a misty and rainy day between the Landmannalaugar Area camp and Mount Blahnukur within south western ICELAND - Major adventure travel Robert Obst Retirement Program or Adventure Travel Obst Family on Ice or Obst Adventures with Kids within and around and across Iceland 2015 (5 August 2015; Iceland Landmannalaugar & Hekla Volcano Area; Obst FAV Photos 2015 Nikon D810 Daily Best Obst Image 0952)" NOTE: "The 'Capture Date" of ALL images captured after 5 AM within my 'Obst Family on Ice 2015' collection is OFF by one day before the actual date, so to determine the correct 'Capture Date' on images captured after 5 AM one must ADD ONE day to the 'Capture Date" as recorded by my Nikon D810 camera." 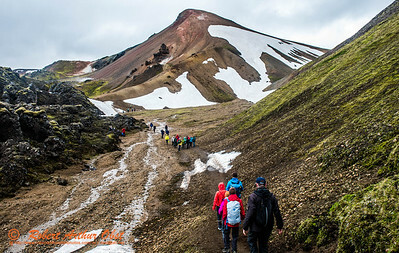 "Hikers carefully making their way down a slippery trail towards volcanic geothermal steam vents on misty and rainy day between the Landmannalaugar Area camp and Mount Blahnukur within south western ICELAND - Major adventure travel Robert Obst Retirement Program or Adventure Travel Obst Family on Ice or Obst Adventures with Kids within and around and across Iceland 2015 (5 August 2015; Iceland Landmannalaugar & Hekla Volcano Area; Obst FAV Photos 2015 Nikon D810 Landscapes Inspirational Geothermal Volcanic Image 0949)" NOTE: "The 'Capture Date" of ALL images captured after 5 AM within my 'Obst Family on Ice 2015' collection is OFF by one day before the actual date, so to determine the correct 'Capture Date' on images captured after 5 AM one must ADD ONE day to the 'Capture Date" as recorded by my Nikon D810 camera." 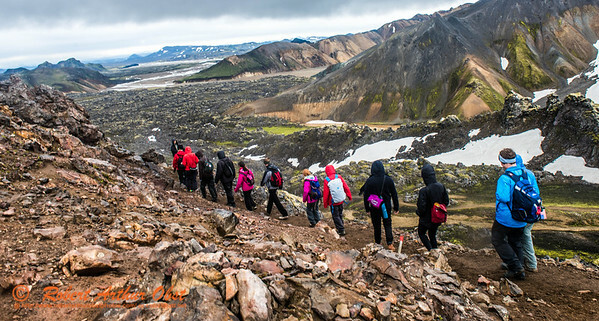 "Hikers carefully making their way down a slippery trail on misty and rainy day between the Landmannalaugar Area camp and Mount Blahnukur within south western ICELAND - Major adventure travel Robert Obst Retirement Program or Adventure Travel Obst Family on Ice or Obst Adventures with Kids within and around and across Iceland 2015 (5 August 2015; Iceland Landmannalaugar & Hekla Volcano Area; Obst FAV Photos 2015 Nikon D810 Sports Fun Extraordinaire Action Outdoors Image 0944)" NOTE: "The 'Capture Date" of ALL images captured after 5 AM within my 'Obst Family on Ice 2015' collection is OFF by one day before the actual date, so to determine the correct 'Capture Date' on images captured after 5 AM one must ADD ONE day to the 'Capture Date" as recorded by my Nikon D810 camera." 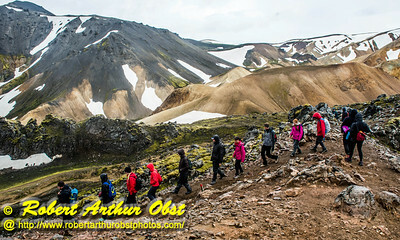 "Hikers carefully making their way down a slippery trail on misty and rainy day between the Landmannalaugar Area camp and Mount Blahnukur within south western ICELAND - Major adventure travel Robert Obst Retirement Program or Adventure Travel Obst Family on Ice or Obst Adventures with Kids within and around and across Iceland 2015 (5 August 2015; Iceland Landmannalaugar & Hekla Volcano Area; Obst FAV Photos 2015 Nikon D810 Destinations Wild Hiking Image 0940)" NOTE: "The 'Capture Date" of ALL images captured after 5 AM within my 'Obst Family on Ice 2015' collection is OFF by one day before the actual date, so to determine the correct 'Capture Date' on images captured after 5 AM one must ADD ONE day to the 'Capture Date" as recorded by my Nikon D810 camera." 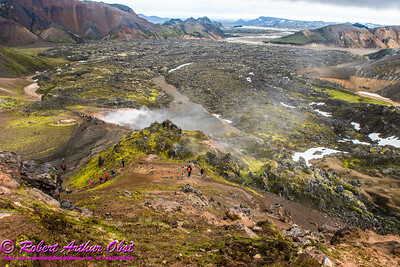 "Hiker's view of the volcanic steam vents and badlands bordering the rugged trail between the Landmannalaugar Area camp and Mount Blahnukur within south western ICELAND - Major adventure travel Robert Obst Retirement Program or Adventure Travel Obst Family on Ice or Obst Adventures with Kids within and around and across Iceland 2015 (5 August 2015; Iceland Landmannalaugar & Hekla Volcano Area; Obst FAV Photos 2015 Nikon D810 Adventure Travel Targeted Destinations or ATTD ICELAND Image 0939)" NOTE: "The 'Capture Date" of ALL images captured after 5 AM within my 'Obst Family on Ice 2015' collection is OFF by one day before the actual date, so to determine the correct 'Capture Date' on images captured after 5 AM one must ADD ONE day to the 'Capture Date" as recorded by my Nikon D810 camera." 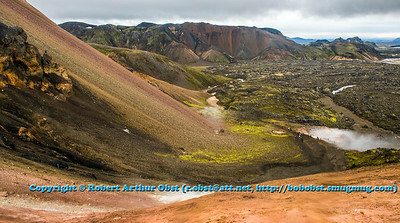 "Hiker's view of the volcanic steam vents and badlands bordering the rugged trail between the Landmannalaugar Area camp and Mount Blahnukur within south western ICELAND - Major adventure travel Robert Obst Retirement Program or Adventure Travel Obst Family on Ice or Obst Adventures with Kids within and around and across Iceland 2015 (5 August 2015; Iceland Landmannalaugar & Hekla Volcano Area; Obst FAV Photos 2015 Nikon D810 Daily Best Obst Iceland Image 0937)" NOTE: "The 'Capture Date" of ALL images captured after 5 AM within my 'Obst Family on Ice 2015' collection is OFF by one day before the actual date, so to determine the correct 'Capture Date' on images captured after 5 AM one must ADD ONE day to the 'Capture Date" as recorded by my Nikon D810 camera." 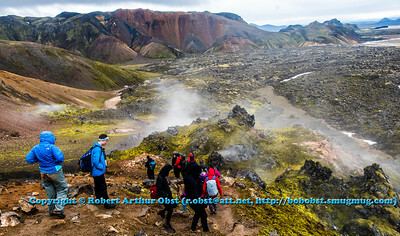 "Hiker's view of the volcanic steamy badlands and mountains bordering the rugged trail between the Landmannalaugar Area camp and Mount Blahnukur within south western ICELAND - Major adventure travel Robert Obst Retirement Program or Adventure Travel Obst Family on Ice or Obst Adventures with Kids within and around and across Iceland 2015 (5 August 2015; Iceland Landmannalaugar & Hekla Volcano Area; Obst FAV Photos 2015 Nikon D810 Landscapes Inspirational Geothermal Volcanic Image 0930)" NOTE: "The 'Capture Date" of ALL images captured after 5 AM within my 'Obst Family on Ice 2015' collection is OFF by one day before the actual date, so to determine the correct 'Capture Date' on images captured after 5 AM one must ADD ONE day to the 'Capture Date" as recorded by my Nikon D810 camera." 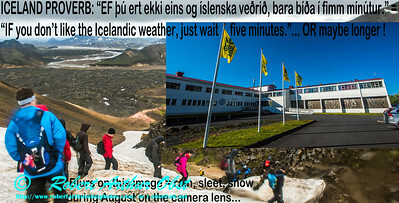 "Hikers carefully making their way down a slippery and snow-covered trail on misty and rainy day between the Landmannalaugar Area camp and Mount Blahnukur within south western ICELAND - Major adventure travel Robert Obst Retirement Program or Adventure Travel Obst Family on Ice or Obst Adventures with Kids within and around and across Iceland 2015 (5 August 2015; Iceland Landmannalaugar & Hekla Volcano Area; Obst FAV Photos 2015 Nikon D810 Sports Fun Extraordinaire Action Outdoors Image 0919)" NOTE: "The 'Capture Date" of ALL images captured after 5 AM within my 'Obst Family on Ice 2015' collection is OFF by one day before the actual date, so to determine the correct 'Capture Date' on images captured after 5 AM one must ADD ONE day to the 'Capture Date" as recorded by my Nikon D810 camera." 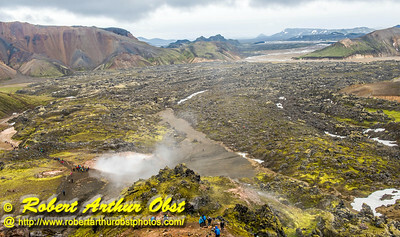 "View from near the top of 3100 FT Mount Blahnukur on a misty and rainy day by the trail between the Landmannalaugar Area camp and Mount Blahnukur within south western ICELAND - Major adventure travel Robert Obst Retirement Program or Adventure Travel Obst Family on Ice or Obst Adventures with Kids within and around and across Iceland 2015 (5 August 2015; Iceland Landmannalaugar & Hekla Volcano Area; Obst FAV Photos 2015 Nikon D810 Daily Best Obst Image 0897)" NOTE: "The 'Capture Date" of ALL images captured after 5 AM within my 'Obst Family on Ice 2015' collection is OFF by one day before the actual date, so to determine the correct 'Capture Date' on images captured after 5 AM one must ADD ONE day to the 'Capture Date" as recorded by my Nikon D810 camera." 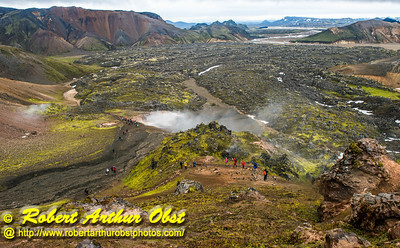 "View from near the top of 3100 FT Mount Blahnukur on a misty and rainy day by the trail between the Landmannalaugar Area camp and Mount Blahnukur within south western ICELAND - Major adventure travel Robert Obst Retirement Program or Adventure Travel Obst Family on Ice or Obst Adventures with Kids within and around and across Iceland 2015 (5 August 2015; Iceland Landmannalaugar & Hekla Volcano Area; Obst FAV Photos 2015 Nikon D810 Daily Best Obst Image 0889)" NOTE: "The 'Capture Date" of ALL images captured after 5 AM within my 'Obst Family on Ice 2015' collection is OFF by one day before the actual date, so to determine the correct 'Capture Date' on images captured after 5 AM one must ADD ONE day to the 'Capture Date" as recorded by my Nikon D810 camera." 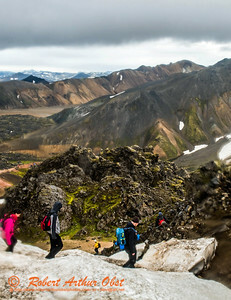 " 'Trek Iceland' hikers ascending scree, snow and ice fields over the trail between the Landmannalaugar Area camp and 3100 FT Mount Blahnukur within south western ICELAND - Major adventure travel Robert Obst Retirement Program or Adventure Travel Obst Family on Ice or Obst Adventures with Kids within and around and across Iceland 2015 (5 August 2015; Iceland Landmannalaugar & Hekla Volcano Area; Obst FAV Photos 2015 Nikon D810 Sports Fun Extraordinaire Action Outdoors Image 0882)" NOTE: "The 'Capture Date" of ALL images captured after 5 AM within my 'Obst Family on Ice 2015' collection is OFF by one day before the actual date, so to determine the correct 'Capture Date' on images captured after 5 AM one must ADD ONE day to the 'Capture Date" as recorded by my Nikon D810 camera." 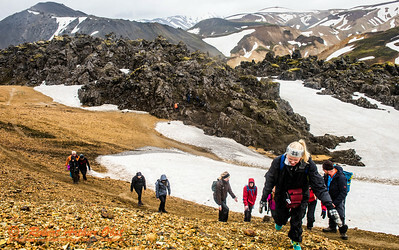 " 'Trek Iceland' hikers pausing hiking up over scree, snow and ice fields over the trail between the Landmannalaugar Area camp and 3100 FT Mount Blahnukur within south western ICELAND - Major adventure travel Robert Obst Retirement Program or Adventure Travel Obst Family on Ice or Obst Adventures with Kids within and around and across Iceland 2015 (5 August 2015; Iceland Landmannalaugar & Hekla Volcano Area; Obst FAV Photos 2015 Nikon D810 Destinations Wild Scenic Hiking Image 0879)" NOTE: "The 'Capture Date" of ALL images captured after 5 AM within my 'Obst Family on Ice 2015' collection is OFF by one day before the actual date, so to determine the correct 'Capture Date' on images captured after 5 AM one must ADD ONE day to the 'Capture Date" as recorded by my Nikon D810 camera." 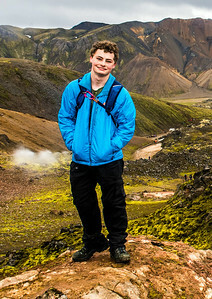 " Hiker's view of the rugged landscape and geothermal steam vents along the trail between the Landmannalaugar Area camp and 3100 FT Mount Blahnukur within south western ICELAND - Major adventure travel Robert Obst Retirement Program or Adventure Travel Obst Family on Ice or Obst Adventures with Kids within and around and across Iceland 2015 (5 August 2015; Iceland Landmannalaugar & Hekla Volcano Area; Obst FAV Photos 2015 Nikon D810 Destinations Wild Scenic Hiking Image 0873)" NOTE: "The 'Capture Date" of ALL images captured after 5 AM within my 'Obst Family on Ice 2015' collection is OFF by one day before the actual date, so to determine the correct 'Capture Date' on images captured after 5 AM one must ADD ONE day to the 'Capture Date" as recorded by my Nikon D810 camera." 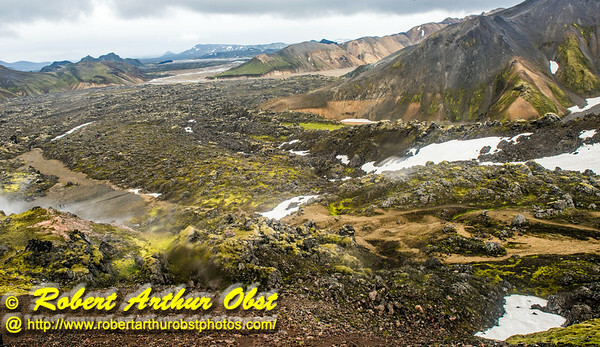 " Hiker's view of the rugged volcanic landscape and geothermal steam vents along the trail between the Landmannalaugar Area camp and 3100 FT Mount Blahnukur within south western ICELAND - Major adventure travel Robert Obst Retirement Program or Adventure Travel Obst Family on Ice or Obst Adventures with Kids within and around and across Iceland 2015 (5 August 2015; Iceland Landmannalaugar & Hekla Volcano Area; Obst FAV Photos 2015 Nikon D810 Daily Best Obst Image 0870)" NOTE: "The 'Capture Date" of ALL images captured after 5 AM within my 'Obst Family on Ice 2015' collection is OFF by one day before the actual date, so to determine the correct 'Capture Date' on images captured after 5 AM one must ADD ONE day to the 'Capture Date" as recorded by my Nikon D810 camera." 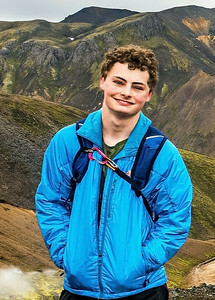 " Arthur Robert Obst on the trail between the Landmannalaugar Area camp and 3100 FT Mount Blahnukur within south western ICELAND - Major adventure travel Robert Obst Retirement Program or Adventure Travel Obst Family on Ice or Obst Adventures with Kids within and around and across Iceland 2015 (5 August 2015; Iceland Landmannalaugar & Hekla Volcano Area; Obst Photos 2015 Nikon D810 Adventure Travel Obst Iceland Image 0867)" NOTE: "The 'Capture Date" of ALL images captured after 5 AM within my 'Obst Family on Ice 2015' collection is OFF by one day before the actual date, so to determine the correct 'Capture Date' on images captured after 5 AM one must ADD ONE day to the 'Capture Date" as recorded by my Nikon D810 camera." 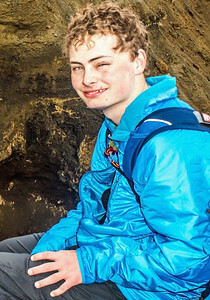 " Hiker's view of the geothermal steam vents along the trail between the Landmannalaugar Area camp and 3100 FT Mount Blahnukur within south western ICELAND - Major adventure travel Robert Obst Retirement Program or Adventure Travel Obst Family on Ice or Obst Adventures with Kids within and around and across Iceland 2015 (5 August 2015; Iceland Landmannalaugar & Hekla Volcano Area; Obst FAV Photos 2015 Nikon D810 Landscapes Inspirational Geothermal Volcanic Image 0859)" NOTE: "The 'Capture Date" of ALL images captured after 5 AM within my 'Obst Family on Ice 2015' collection is OFF by one day before the actual date, so to determine the correct 'Capture Date' on images captured after 5 AM one must ADD ONE day to the 'Capture Date" as recorded by my Nikon D810 camera." 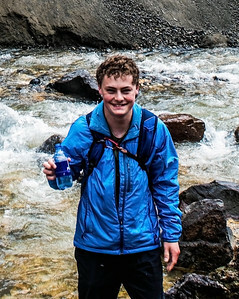 " Hiker's view of the landscape approaching 3100 FT Mt. 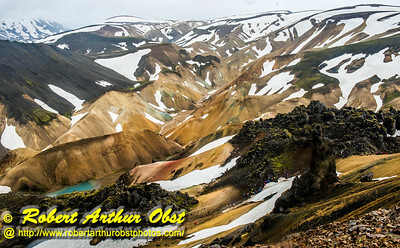 Blahnukur along the trail between the Landmannalaugar Area camp and Mt. 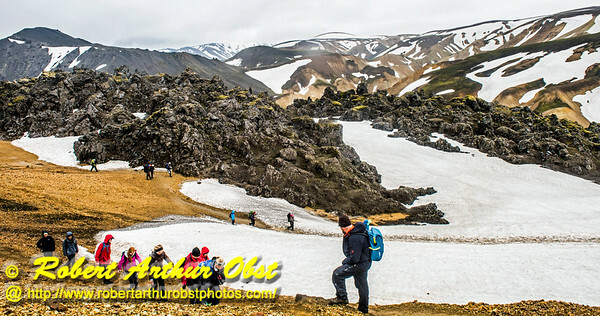 Blahnukur within south western ICELAND - Major adventure travel Robert Obst Retirement Program or Adventure Travel Obst Family on Ice or Obst Adventures with Kids within and around and across Iceland 2015 (5 August 2015; Iceland Landmannalaugar & Hekla Volcano Area; Obst FAV Photos 2015 Nikon D810 Sports Fun Extraordinaire Action Outdoors Image 0853)" NOTE: "The 'Capture Date" of ALL images captured after 5 AM within my 'Obst Family on Ice 2015' collection is OFF by one day before the actual date, so to determine the correct 'Capture Date' on images captured after 5 AM one must ADD ONE day to the 'Capture Date" as recorded by my Nikon D810 camera." 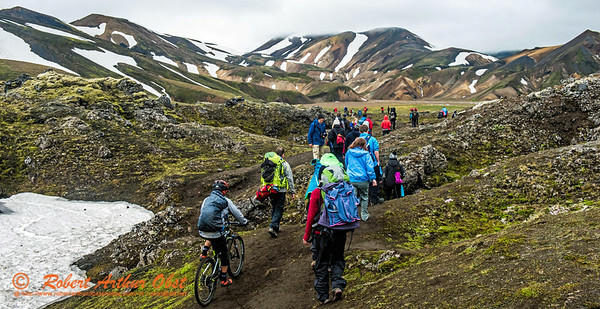 " 'Trek Iceland' hikers and mountain bikers on the trail between the Landmannalaugar Area camp and 3100 FT Mount Blahnukur within south western ICELAND - Major adventure travel Robert Obst Retirement Program or Adventure Travel Obst Family on Ice or Obst Adventures with Kids within and around and across Iceland 2015 (5 August 2015; Iceland Landmannalaugar & Hekla Volcano Area; Obst FAV Photos 2015 Nikon D810 Sports Fun Extraordinaire Action Outdoors Image 0835)" NOTE: "The 'Capture Date" of ALL images captured after 5 AM within my 'Obst Family on Ice 2015' collection is OFF by one day before the actual date, so to determine the correct 'Capture Date' on images captured after 5 AM one must ADD ONE day to the 'Capture Date" as recorded by my Nikon D810 camera." 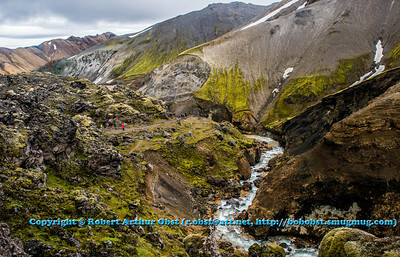 " Hiker's view of start of the trail from near the Landmannalaugar Area camp to 3100 FT Mount Blahnukur within south western ICELAND - Major adventure travel Robert Obst Retirement Program or Adventure Travel Obst Family on Ice or Obst Adventures with Kids within and around and across Iceland 2015 (5 August 2015; Iceland Landmannalaugar & Hekla Volcano Area; Obst FAV Photos 2015 Nikon D810 Destinations Wild Scenic Hiking Image 0820)" NOTE: "The 'Capture Date" of ALL images captured after 5 AM within my 'Obst Family on Ice 2015' collection is OFF by one day before the actual date, so to determine the correct 'Capture Date' on images captured after 5 AM one must ADD ONE day to the 'Capture Date" as recorded by my Nikon D810 camera." 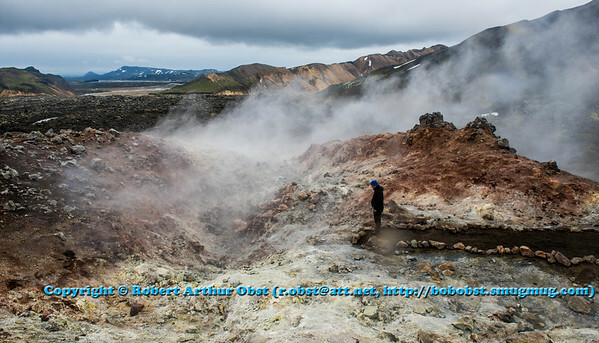 " Four wheel drive vehicle rider's and bather's view of geothermal hot springs-fed waterways and steamy wetlands within the Landmannalaugar Area of south western ICELAND - Major adventure travel Robert Obst Retirement Program or Adventure Travel Obst Family on Ice or Obst Adventures with Kids within and around and across Iceland 2015 (5 August 2015; Iceland Landmannalaugar & Hekla Volcano Area; Obst FAV Photos 2015 Nikon D810 Landscapes Inspirational Geothermal Volcanic Image 0808)" NOTE: "The 'Capture Date" of ALL images captured after 5 AM within my 'Obst Family on Ice 2015' collection is OFF by one day before the actual date, so to determine the correct 'Capture Date' on images captured after 5 AM one must ADD ONE day to the 'Capture Date" as recorded by my Nikon D810 camera." 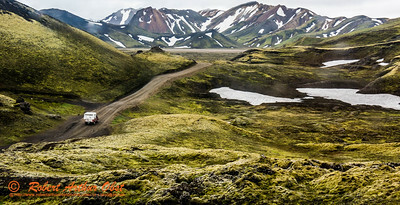 " Four wheel drive vehicle operator's view of the rugged green almost phosphorescent snowy mountains and badlands within the Landmannalaugar Area of south western ICELAND - Major adventure travel Robert Obst Retirement Program or Adventure Travel Obst Family on Ice or Obst Adventures with Kids within and around and across Iceland 2015 (5 August 2015; Iceland Landmannalaugar & Hekla Volcano Area; Obst FAV Photos 2015 Nikon D810 Sports Fun Extraordinaire Action Outdoors Image 0729)" NOTE: "The 'Capture Date" of ALL images captured after 5 AM within my 'Obst Family on Ice 2015' collection is OFF by one day before the actual date, so to determine the correct 'Capture Date' on images captured after 5 AM one must ADD ONE day to the 'Capture Date" as recorded by my Nikon D810 camera." 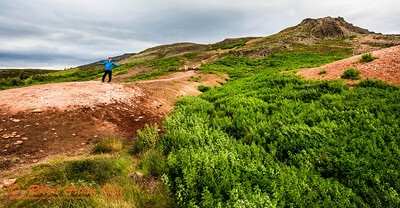 " Four wheel drive vehicle rider's view of the rugged green almost phosphorescent mountains within the Landmannalaugar Area of south western ICELAND - Major adventure travel Robert Obst Retirement Program or Adventure Travel Obst Family on Ice or Obst Adventures with Kids within and around and across Iceland 2015 (5 August 2015; Iceland Geysir Hot Springs; Obst FAV Photos 2015 Nikon D810 Daily Best Obst Iceland Image 0725)" NOTE: "The 'Capture Date" of ALL images captured after 5 AM within my 'Obst Family on Ice 2015' collection is OFF by one day before the actual date, so to determine the correct 'Capture Date' on images captured after 5 AM one must ADD ONE day to the 'Capture Date" as recorded by my Nikon D810 camera." " Hiker's view of the geothermal landscapes which are typical within the colorful Geysir Hot Springs area of south western ICELAND - Major adventure travel Robert Obst Retirement Program or Adventure Travel Obst Family on Ice or Obst Adventures with Kids within and around and across Iceland 2015 (4 August 2015; Iceland Geysir Hot Springs; Obst FAV Photos 2015 Nikon D810 Destinations Wild Scenic Hiking Image 0711)" NOTE: "The 'Capture Date" of ALL images captured after 5 AM within my 'Obst Family on Ice 2015' collection is OFF by one day before the actual date, so to determine the correct 'Capture Date' on images captured after 5 AM one must ADD ONE day to the 'Capture Date" as recorded by my Nikon D810 camera." 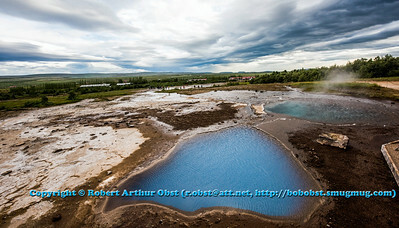 " Hiker's view of one of the twin pools of the Blesi or "The Blazer" within the colorful Geysir Hot Springs area of south western ICELAND - Major adventure travel Robert Obst Retirement Program or Adventure Travel Obst Family on Ice or Obst Adventures with Kids within and around and across Iceland 2015 (4 August 2015; Iceland Geysir Hot Springs; Obst FAV Photos 2015 Nikon D810 Landscapes Inspirational Geothermal Volcanic Image 0710)" NOTE: "The 'Capture Date" of ALL images captured after 5 AM within my 'Obst Family on Ice 2015' collection is OFF by one day before the actual date, so to determine the correct 'Capture Date' on images captured after 5 AM one must ADD ONE day to the 'Capture Date" as recorded by my Nikon D810 camera." 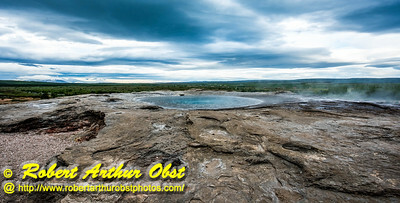 " Hiker's view of one of the twin pools of the Blesi or "The Blazer" within the colorful Geysir Hot Springs area of south western ICELAND - Major adventure travel Robert Obst Retirement Program or Adventure Travel Obst Family on Ice or Obst Adventures with Kids within and around and across Iceland 2015 (4 August 2015; Iceland Geysir Hot Springs; Obst FAV Photos 2015 Nikon D810 Daily Best Obst Iceland Image 0709)" NOTE: "The 'Capture Date" of ALL images captured after 5 AM within my 'Obst Family on Ice 2015' collection is OFF by one day before the actual date, so to determine the correct 'Capture Date' on images captured after 5 AM one must ADD ONE day to the 'Capture Date" as recorded by my Nikon D810 camera." 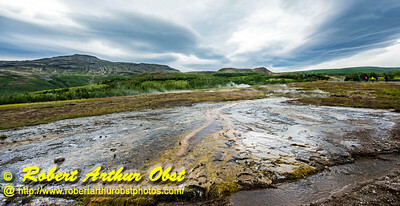 " Hiker's view of geothermal activities from the trail on the rise behind the colorful Geysir Hot Springs area of south western ICELAND - Major adventure travel Robert Obst Retirement Program or Adventure Travel Obst Family on Ice or Obst Adventures with Kids within and around and across Iceland 2015 (4 August 2015; Iceland Geysir Hot Springs; Obst FAV Photos 2015 Nikon D810 Sports Fun Extraordinaire Action Outdoors Iceland Image 0699)" NOTE: "The 'Capture Date" of ALL images captured after 5 AM within my 'Obst Family on Ice 2015' collection is OFF by one day before the actual date, so to determine the correct 'Capture Date' on images captured after 5 AM one must ADD ONE day to the 'Capture Date" as recorded by my Nikon D810 camera." 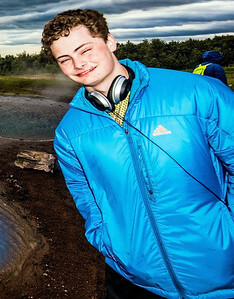 " Arthur Robert Obst enjoying a view of the pools of the Blesi or "The Blazer" within the colorful Geysir Hot Springs area of south western ICELAND - Major adventure travel Robert Obst Retirement Program or Adventure Travel Obst Family on Ice or Obst Adventures with Kids within and around and across Iceland 2015 (4 August 2015; Iceland Geysir Hot Springs; Obst Photos 2015 Nikon D810 Adventure Travel Obst Iceland Image 0696)" NOTE: "The 'Capture Date" of ALL images captured after 5 AM within my 'Obst Family on Ice 2015' collection is OFF by one day before the actual date, so to determine the correct 'Capture Date' on images captured after 5 AM one must ADD ONE day to the 'Capture Date" as recorded by my Nikon D810 camera." 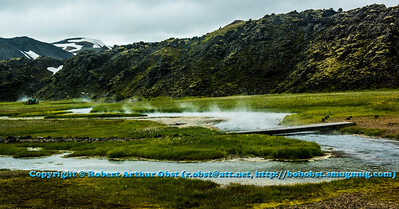 " Hiker's view of the twin pools of the Blesi or "The Blazer" within the colorful Geysir Hot Springs area of south western ICELAND - Major adventure travel Robert Obst Retirement Program or Adventure Travel Obst Family on Ice or Obst Adventures with Kids within and around and across Iceland 2015 (4 August 2015; Iceland Geysir Hot Springs; Obst FAV Photos 2015 Nikon D810 Destinations Wild Scenic Hiking Image 0695)" NOTE: "The 'Capture Date" of ALL images captured after 5 AM within my 'Obst Family on Ice 2015' collection is OFF by one day before the actual date, so to determine the correct 'Capture Date' on images captured after 5 AM one must ADD ONE day to the 'Capture Date" as recorded by my Nikon D810 camera." 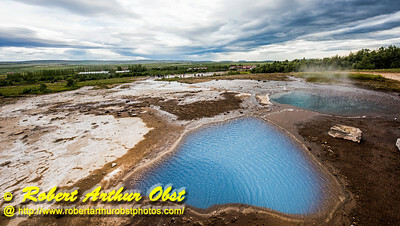 " The twin pools of the Blesi or "The Blazer" within the colorful Geysir Hot Springs area of south western ICELAND - Major adventure travel Robert Obst Retirement Program or Adventure Travel Obst Family on Ice or Obst Adventures with Kids within and around and across Iceland 2015 (4 August 2015; Iceland Geysir Hot Springs; Obst FAV Photos 2015 Nikon D810 Landscapes Inspirational Geothermal Volcanic Image 0694)" NOTE: "The 'Capture Date" of ALL images captured after 5 AM within my 'Obst Family on Ice 2015' collection is OFF by one day before the actual date, so to determine the correct 'Capture Date' on images captured after 5 AM one must ADD ONE day to the 'Capture Date" as recorded by my Nikon D810 camera." " Beginning of an eruption of the Strokkur Geysir or 'The Churn' within the colorful Geysir Hot Springs area of south western ICELAND - Major adventure travel Robert Obst Retirement Program or Adventure Travel Obst Family on Ice or Obst Adventures with Kids within and around and across Iceland 2015 (4 August 2015; Iceland Geysir Hot Springs; Obst FAV Photos 2015 Nikon D810 Landscapes Inspirational Geothermal Volcanic Image 0685)" NOTE: "The 'Capture Date" of ALL images captured after 5 AM within my 'Obst Family on Ice 2015' collection is OFF by one day before the actual date, so to determine the correct 'Capture Date' on images captured after 5 AM one must ADD ONE day to the 'Capture Date" as recorded by my Nikon D810 camera." 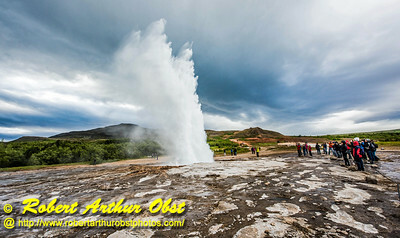 " Impressive eruption of the Strokkur Geysir or 'The Churn' within the colorful Geysir Hot Springs area of south western ICELAND - Major adventure travel Robert Obst Retirement Program or Adventure Travel Obst Family on Ice or Obst Adventures with Kids within and around and across Iceland 2015 (4 August 2015; Iceland Geysir Hot Springs; Obst FAV Photos 2015 Nikon D810 Landscapes Inspirational Geothermal Volcanic Image 0676)" NOTE: "The 'Capture Date" of ALL images captured after 5 AM within my 'Obst Family on Ice 2015' collection is OFF by one day before the actual date, so to determine the correct 'Capture Date' on images captured after 5 AM one must ADD ONE day to the 'Capture Date" as recorded by my Nikon D810 camera." 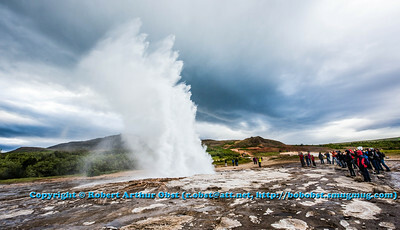 " Impressive eruption of the Strokkur Geysir or 'The Churn' within the colorful Geysir Hot Springs area of south western ICELAND - Major adventure travel Robert Obst Retirement Program or Adventure Travel Obst Family on Ice or Obst Adventures with Kids within and around and across Iceland 2015 (4 August 2015; Iceland Geysir Hot Springs; Obst FAV Photos 2015 Nikon D810 Daily Best Obst Iceland Image 0674)" NOTE: "The 'Capture Date" of ALL images captured after 5 AM within my 'Obst Family on Ice 2015' collection is OFF by one day before the actual date, so to determine the correct 'Capture Date' on images captured after 5 AM one must ADD ONE day to the 'Capture Date" as recorded by my Nikon D810 camera." 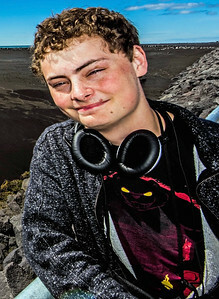 From LI: Geothermal Volcanic !